Psa 1:3 And he shall be like a tree planted by the rivulets of water that brings forth its fruit in its seasons, and its leaf shall not wither, and all which he does shall be blessed. 1. The Bark and how to strengthen it. This is done via consistent reading of the word of God. Consistent gains in knewledge and understanding build a syatem of operation in your life and establishes a framework for propper feeding on the soil. The xylem is responsible for the transport of water and soluble mineral nutrients from the roots throughout the plant. It is constructed via a series of tubes that work in union with each other. There is a set order of how things should move. Within this framework the plant gets it’s nutrients from the roots. The two main things that we do in our christian walk that establishes a set order of growth in our life is simple. Mar 6:46 And when he had sent them away, he departed into a mountain to pray. You can never go wrong with such a foundation. That song does not lie. Feeding your bark does not only cause you to grow, but it gives your branches a better chance of stretching to places where sunlight is abundant and it can get CO2 to produce energy to bring forth flowers. 2. Branches stretch out and grow leaves. Branches try to give leaves the best chance to receive sunlight. Stretching out far and wide. We to must stretch and try different things, different ministries, explore our giftings and see where we fall in. Branching out is one of the most difficult things that one can do. It takes you out of your comfort zone. You have to do things you would not normally do all for the sake of Christ. What really is branching out?…. There was a guy in a boat, who was all well and good inside and he was Jesus walking on the water. What Peter did was step out and try something that he did not think he could do. Or he could have been thinking that he could do it. Either way he branched out from his comfort zone to meet Jesus somewhere else. He had faith that what he was going to do, God called him and he was going with the purpose of fulfilling Jesus’ call. Often times we get comfortable and don’t want to spread out our branches… we stay in the boat and don’t try to walk on water. How do we practically stretch out our branches? There are many activities in the Local Church that we can become active in. At the bark and branch stage local church involvement is the most important part. It is important because this is the stage where we start to see where our fruits are going to be brought forth. SPREAD YOUR BRANCHES…. you will never know which ministry is yours and where you are destined to bear fruit! If you don’t try, you will be in your comfort zone and you will be sitting down on your gifts. 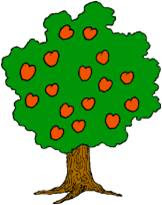 So yes, you will be an established tree, but you won’t be bringing forth any fruit which is THE GOAL. 3. The leaves assist in making energy for the tree. When a leaf finds a favourable spot and conditions it gives rise to potential for a flower. When you settle yourself in your calling u start to work and prepare things to bring forth flowers….then fruit. Photosynthesis[a] is a process that converts carbon dioxide into organic compounds, especially sugars, using the energy from sunlight. The purpose of the leaf is to produce sugars and material for the tree to flourish. It gets in a good position and takes the sunlight that it can get to convert it to minerals that the plant can use. Act 6:3 Wherefore, brethren, look ye out among you seven men of honest report, full of the Holy Ghost and wisdom, whom we may appoint over this business. The Local Church is supposed to create a springboard of people that go out to impact the world. They don’t have to leave the church membership but people have to spread their branches and find what the Lord has for them to do in this earth and begin to work in it.